If this card is in your Graveyard: You can banish 1 other Plant-Type monster from your Graveyard; Special Summon this card from your Graveyard and increase its Level by the Level of that banished monster. 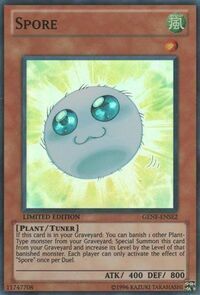 Each player can only activate the effect of "Spore" once per Duel. This card is a counterpart to Copy Plant. Both are Level 1 WIND Plant-Type Tuner monsters with an effect that copies the Level of another Plant-Type monster. This card, along with Injection Fairy Lily and United We Stand, have spent the least amount of time on the Forbidden List, having only been on it for a total of one format. "Spore" is Special Summoned with its Level already increased by the Level of the removed monster. Each player can use the effect of "Spore" once per Duel, no matter how many copies they have. Removing from play one other Plant-Type monster is a cost to activate the effect of "Spore". Even if you have multiple copies of "Spore" in your Deck, then if you activate the effect of one copy of "Spore", then you cannot activate the effects of the other copies of "Spore". : If you have three copies of "Spore" in your Deck, then can you use each of the three copies' effect once?